Do you have a pest problem in your home even though you do your best to keep food out of sight and have sealed all entry points into your house? It can be frustrating to go out of your way to prevent pests from getting into your home only to see them show up anyway. There are a number of things you might be doing, though, to attract pests without even knowing it. Here are several ways you might be encouraging pests to come into your home. If you put all of your food away and seal it so that pests can’t get to it, you might think that you’re doing enough to prevent pests. But the truth is many pests and rodents are attracted to the clutter that exists in many homes. Stacks of newspapers, piles of boxes, and other items can serve as welcome signs for pests. Some will eat the clutter while others will use it to build nests. Either way, the pests will end up hanging around because of it, so try to de-clutter your home as often as possible. 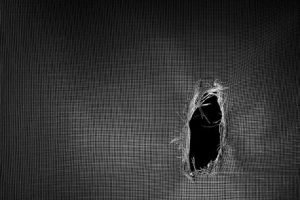 A tiny hole in a screen might not seem like such a big deal for you, but there are plenty of insects and other pests that can find ways to fit through them. And in some instances, all it takes is one or two pests inside of your home to start an infestation. So if you notice a hole in a screen, have it patched or replace the screen to keep pests out. Many pests love moisture and need it to survive. They will be attracted to tiny leaks in your plumbing system and will congregate around them. If you have a pest problem, it could be a result of a plumbing problem, so you should have your plumbing system inspected every now and then to cut down on the chances of an infestation. Don’t let pests keep you down this summer. If you have noticed signs of an infestation in your home, Buffalo Pest Control can help to locate the source of your problem and get rid of it. 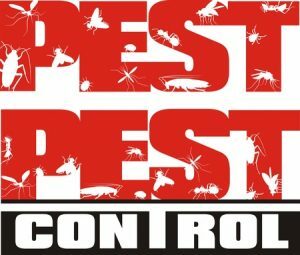 Call us at 716-898-2021 today to have a pest control specialist come out to your home. Pavement ants are very common, and there’s a good chance that you have seen them before. They are approximately 3 millimeters long and are either light brown or black in color. They have a three-segmented club and 12-segmented antennae. In addition, while you can find them in a variety of different places, like underneath stones and in the cracks in sidewalks and pavement, they can cause problems for homeowners if they are able to make their way indoors. What do Pavement Ants Looks For? Like most ants, pavement ants are known to enter homes while looking around for food. They enjoy eating meats and many greasy types of food, which is why they have absolutely no problem making themselves right at home living side by side with humans. They will often colonize inside of homes and then forage for food that they can bring back to their colonies. They will often set up trails that make it easier for them to transport food from one place to another. It can be very difficult for a homeowner to track down a nest that has been built by pavement ants, so if you suspect that you might have an infestation in your home, it’s best to call on a professional for help. 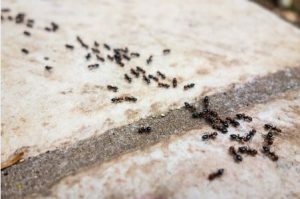 You will know that you have an infestation when you see an influx of pavement ants moving throughout your home, especially in areas where you keep food. Pavement ants can usually be found in cabinets and other places where food is stored, and there will usually be a lot of them in a group. They are most prevalent in homes located in the Midwest, but they show up in other parts of the country as well. Do you need help dealing with pavement ants? Buffalo Pest Control is here to help. We won’t just come in and kill the pavement ants that you can see. We will get to the root of your problem and make sure the pavement ants are completely gone before we leave your home. Call us at 716-898-2021 today to find out how we can make your pavement ant infestation a thing of the past. There are two different types of carpenter bees that are often found in American homes—large carpenter bees and small carpenter bees. But large carpenter bees are more common. They look a lot like bumblebees and can range from black to greenish black to metallic blue in color. They are not known for colonizing like some other kinds of bees, but they do have a tendency to do extensive damage to homes when seeking shelter. Large carpenter bees do not eat wood like you might guess, based on the fact that they are often found living inside of hollowed-out doors, windowsills, decks, and more. But they can excavate these types of wooden objects and make themselves at home in them. They prefer pine, oak, and cypress woods that have not been painted or finished, and they will use the holes they bore into these woods to lay eggs. They leave to eat pollen and nectar and are known to survive for one or two seasons in most parts of the country, depending on the climate. It’s pretty easy to recognize a carpenter bee infestation in your home. If you notice holes in wooden surfaces or sawdust under these surfaces, you may have carpenter bees. 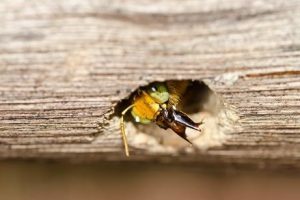 The good news for homeowners is that carpenter bees don’t sting all that often, but they do tend to be very possessive and can get aggressive if they feel threatened. They will fly around people and animals that come near their homes and try to intimidate them. Female carpenter bees will also sting if they are pushed to their breaking point. If you suspect the presence of carpenter bees in your home, you should call on a licensed exterminator to get rid of them. An exterminator can track down the bees, use insecticide dust to kill them, and then seal holes where the bees were living and paint the wood to prevent bees from coming back. Carpenter bees are known to move into spaces that have previously been occupied by other bees, so the sealing part of the process is very important. Buffalo Pest Control has experience with carpenter bees and can help you get rid of them once and for all. Call us at 716-898-2021 to learn more about what we can do to eliminate your carpenter bee problem. Do you have a pest problem in your home? It’s always best to take care of it sooner rather than later to prevent running into any further issues. Pests can cause structural damage to your home, put your health at risk, and make you feel a general uneasiness when you are walking around in your house. But before you call on a pest control company, make sure they are qualified to provide you with the services you need. Here are some tips for choosing the right pest control specialists. All pest control companies need to have certain licenses in order to operate a business. Make sure you find out which licenses those are and ask your pest control company to provide proof of them. Additionally, pest control companies need to be insured properly. This will protect both you and the exterminator sent out to provide you with pest control services, so make sure you ask for proof of insurance. The last thing you want is to hire a pest control company that doesn’t know exactly what they’re doing when they come to your home. They could potentially make your pest problem worse or fail to fix the problem. By working with a pest control company that has more than enough experience, you will increase your chances of getting rid of pests from your home once and for all. You don’t necessarily want to skimp out when it comes to obtaining pest control services. You might get a great deal from a pest control company, but that might mean that they’re not doing everything they can to help you with your problem. So you shouldn’t just look for the pest control services with the lowest price. Instead, you should ask several different companies for quotes before settling on the one that you want to work on your home. It could help you score a great deal and get rid of the pests from your home at the same time. Buffalo Pest Control is properly licensed and insured, and we have experienced exterminators on our staff who are capable of dealing with any pest problem you throw at them. We also offer excellent prices and would love to speak with you about the specific pest control services you need done. Call us at 716-898-2021 today to find out how we can help you eliminate pests from your home. German cockroaches are one of the most common pests found inside of homes and businesses. They have been around for thousands of years now and are known for being able to adapt to almost any environment, so it’s not unusual to find them cowering in dark, humid corners of homes and other structures. They usually tend to congregate in kitchens, bathrooms, and anywhere where food is present. Most German cockroaches are light brown or tan with black horizontal stripes running down their backs. They are approximately 13 to 16 millimeters in length, and they have wings, though most of them prefer to run rather than fly. They are usually introduced into homes and businesses in bags, bags, and other containers that are brought in from the outside, and they have no problem using plumbing pipes and other pipes to navigate throughout buildings. German cockroaches will eat just about anything. They will obviously go after real food first, but they are also known to feast on soap, books, and other everyday household items. They are generally not very picky when it comes to food and will eat whatever is available to them. It’s why it’s important for home and business owners to remove all food sources if a German cockroach infestation is detected. You will know you have German cockroaches in your home or business if you find droppings left behind on floors, countertops, and other surfaces. The droppings are typically small and dark. 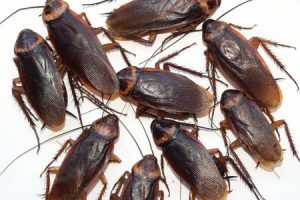 German cockroaches are also often known to secrete a musty odor, so you may be able to smell them before you see them. There is also a chance that you will come across the egg capsules that female German cockroaches leave behind. While German cockroaches are common, it’s important to remove them from your home or business immediately if you find them. It can be difficult to do this on your own, though, so you should seek the help of a pest control specialist if you have a German cockroach infestation. 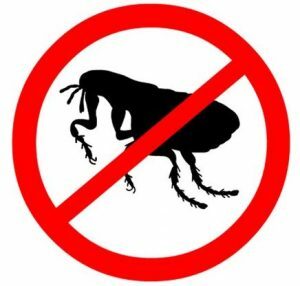 Buffalo Pest Control can help you with a number of pest problems with our effective services. Call us at 716-898-2021 today to schedule an appointment with one of our experienced exterminators. Box elder bugs, which are somewhat futuristic looking, are often found on exterior doors, decks, and walls during spring and summer months in Western New York. The name comes from the tree, called a “boxelder” tree, which they are commonly found on. They have a large presence in the eastern United States, and in Nevada, where boxelder trees frequently grow. Box elder bugs are typically black with red or orange markings on their bodies, and are usually about ½ inch in size. They are an elongated-oval shape and have six legs. They’re not extremely harmful to humans, although their pincers could break skin if one tried to bite you causing a mark similar to a mosquito bite. However, these bugs can be harmful to the trees that they live on or around. They lay their eggs and feed on the leaves and flowers of boxelder and similar trees, and sometimes feed on fruit trees such as apple. When weather is mild, they may swarm onto the sunny side of your home because they are attracted to warm surfaces. If they manage to get in, they can be a nuisance to remove. The 2016 season was particularly bad for box elder bugs, and since they typically crop up in phases, we expect this year to be bad too. 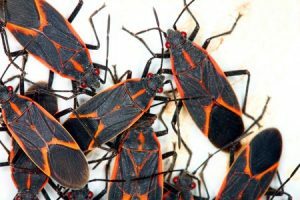 If you have seen box elder bugs in your yard or in your home, it’s important to seal or repair holes in windows, doors, screens, and siding to prevent the bugs from coming inside. Make sure to use strong, outdoor caulk, and install door sweeps to your exterior doors. If you do experience a box elder problem this spring or summer, call us today at Buffalo Pest Control. 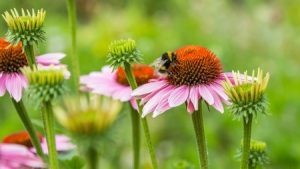 You’re probably getting your gardens ready for the summer season but as you start planning and planting, keep in mind that some plants can actually help keep insects away. If you’re tired of pests invading your summer picnics, consider planting some of the following suggestions to reduce the amount of insects both in and around your home. Planting basil can help prevent house flies as well as mosquitoes, two insects that we all see too often. Basil is often used in the kitchen for dishes such as salads, pasta, soups, and much more. Planting it will give you a useful herb for your kitchen and will also reduce the amount of insects you see. We suggest planting basil in a pot in space that you typically entertain such as a patio or deck. Most people love the smell of lavender, and luckily, most insects do not. Insects such as moths, fleas, flies, and mosquitoes are typically disgusted at the smell of lavender. Lavender is an herb that provides a fresh, sweet smell. Put a few small bunches of lavender into your home as a natural air fresher and to keep flies and other pests outside. These colorful flowers, bursting bright in purples and pinks, can keep away aphids, tomato horn worms, asparagus beetles, and more. Often referred to as “nature’s pesticide,” petunias can provide a beautiful splash of color into your garden and they require little work as far as maintenances. They should be planted alongside vegetables such as beans, basil, tomatoes, and peppers to protect the produce. 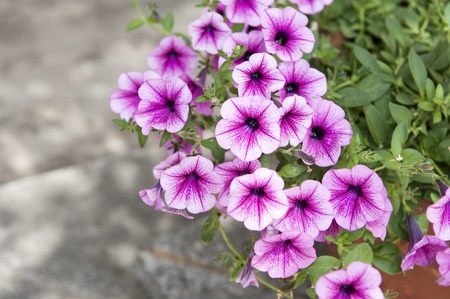 These flowers are known to repel Japanese beetles, silverfish, bedbugs, ticks, and much more. These flowers contain pyrethrum, which is an ingredient capable of killing flying and jumping insects. This ingredient is used in many different garden and home insecticide products. These flowers also come in a variety of colors ranging from light pinks to deep oranges. If you find that you have pest issues this spring or summer season, contact Buffalo Pest Control to handle it for you. Unfortunately, the number of insects we notice within our home this spring could rise. Typically, Western New York winters are bitter, blustery, and freezing. However, with February 2017 coming to a close, this past month set the record for being the warmest February for Buffalo in 147 years. Overall, Western New York has had a relatively mild winter. The average temperature this February was 34 degrees, which quite frankly, is unseasonably warm for the middle of a Buffalo winter. Many people are wondering if such a mild winter might affect insects as temperatures warm up. You’ve probably noticed some bugs suddenly coming to life in your home and you’re wondering if warm temperatures will mean more active insects this spring. Unfortunately, it’s hard to tell if a mild winter might contribute to the number of insects that will soon spring up. As we’ve discussed before, winter doesn’t kill all bugs. Many bugs remain dormant through winter and wait out the cold temperatures, but not all of them die out. Some insects adapt to weather changes and live through them using different methods. Many insects spend winter seeking out warmer temperatures inside of homes, buildings, and so forth. Those insects typically survive regardless of outside temperature. For insects that choose to remain outside during winter months, whether remaining dormant or adapting to changing temperatures, they are likely having an easier time doing so this winter. If anything, more insects will survive this winter because they haven’t had harsh weather. You very well might notice more insects this spring as a result of warm winter temperatures. The weather has been working in their favor, after all. We love winter sunshine in Buffalo, and unfortunately, pests do too. 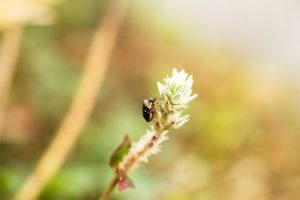 If you experience an insect invasion this spring, contact Buffalo Pest Control. Even though it’s snowing in Western New York, spring really is within our reach. In about a month or so, we can bid farewell to winter and spring into a new season. Spring brings sunshine, flowers, and warmer temperatures, and with all of those things, comes pests and insects. Now is the time to start defending your home again spring insects and pests. You should consider getting your air ducts as well as your air conditioner cleaned out. Insects and pests often nest in these spots during winter month. Consider cleaning out your vents, registers, ducts, air conditioning, and so forth. Preparing your yard can also help prevent pests and insects from invading your home. Consider cutting back your bushes and plants, especially the ones closest to your home. Any landscaping that touches your house is essentially a sidewalk that leads into your home for insects. Leave twelve to eighteen inches between plants and your house. Simply cleaning your home can also prevent insects from invading. Start your spring cleaning now and scrub floors, counters, appliances, and so forth. Wipe up any crumbs, sticky spots, and so forth that might still be lingering in your kitchen or otherwise. You should also clean pet bowls which are notorious for attracting insects. Replace any broken screens that have holes or tears, regardless of the size. ou should also make sure you are sealing any cracks within your foundation as well. If you do run into uninvited spring guests when warmer weather arrives, contact Buffalo Pest Control.